Purple needlegrass (Nassella pulchra); public domain photo on Wikipedia. Prior to the import of Mediterranean annual grasses (which now dominate California grasslands), purple needlegrass was the major grassland cover type of California. 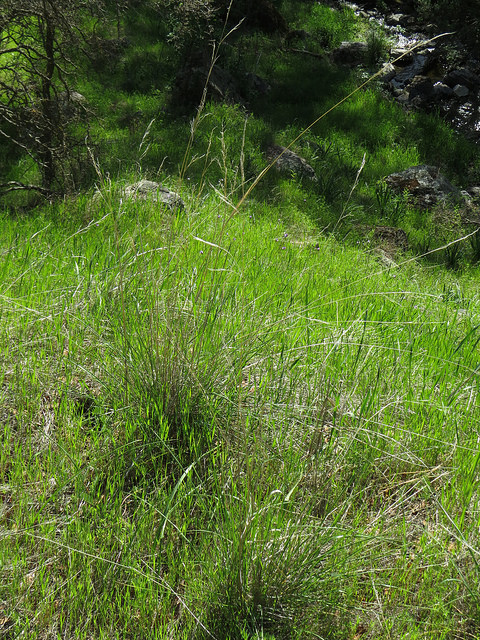 One advantage of the native bunchgrasses that once dominated the California prairie is the longer green feed period (meaning higher quality forage for animals). An act to add Section 425.10 to the Government Code, relating to State Grass. (a) Nassella pulchra, or purple needlegrass as it is commonly known, is the most extensive and widespread native perennial bunchgrass found in the state, with a range extending from the Oregon border into northern Baja California. 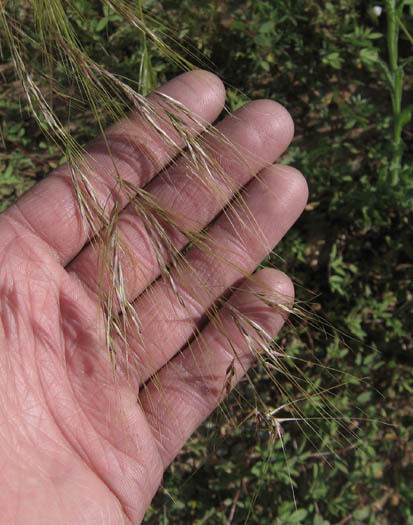 (b) The seed of this grass species was one of several used by many California Native American communities as a food source. It remains an important food source for wildlife. (c) During the period of Mexican control of California, Nassella pulchra was used for cattle grazing to support the huge cowhide and tallow industry. Today, Nassella pulchra continues to provide forage for California’s important cattle industry. (d) The deep root systems of this grass support the survival of young oak trees by promoting mycorrihizal fungi, which are important to their health.With a lifespan of up to 100 years, Nassella pulchra provides food for more than 330 terrestrial species of life. (e) Once established, Nassella pulchra helps repel the invasion of weeds and has been used for numerous restoration projects such as establishing a specific habitat for fauna, erosion control, and stormwater containment levees. It is hardy, drought resistant, desirable forage to livestock, and easily recognizable. (f) Nassella pulchra burns more slowly than flash-burning annual stubble and speeds postfire recovery of burned habitat. (g) Because Nassella pulchra is native to California, many who work with native plants and habitat restoration have already informally named this species as the State Grass. (h) With new species of exotic grasses and weeds emerging everyday, it is important to recognize Nassella pulchra as a symbol of the heritage, splendor, and natural diversity found in the early days of California. (i) Nassella pulchra is used as a teaching tool as a symbol of the natural environment of early California, and protecting the history of Nassella pulchra is essential to safeguarding this precious resource and enhancing grassland heritage throughout the state. Nassella pulchra (purple needlegrass); photo by D in Orbit on Flickr (noncommercial use permitted with attribution / no derivative works).